Could some bad questions be avoided with additional prompting? The answer I'm guessing is probably not, as the users that ask these types of questions don't care much for researching questions and putting effort in to asking. 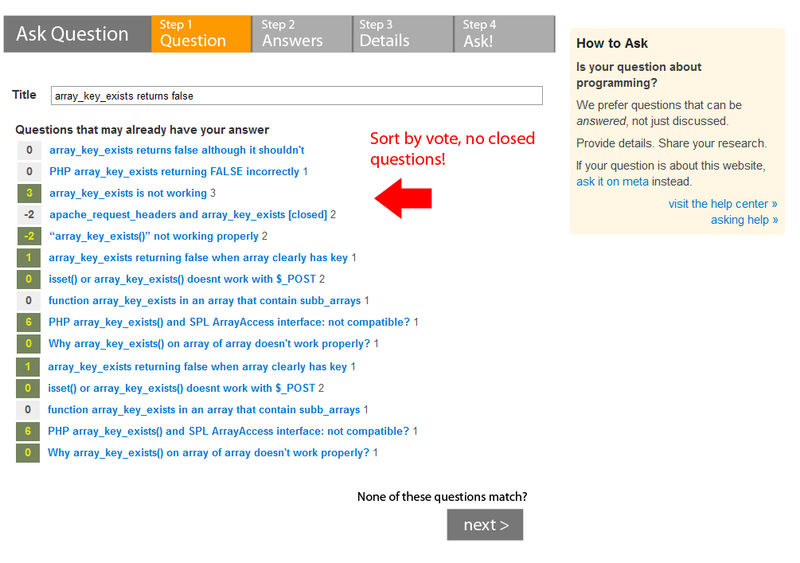 My suggestion would be for new users, or those with a history of asking poor questions based on closure rate or down votes. I'm sure SO have algorithms to identify and flag the types of users I'm talking about. While these questions will probably end up in the "Low Quality" review queue, could additional prompts make some of these users think for a second before clicking "Post Your Question". Could additional checks be carried out on the post to check for inclusion of links (research effort), inclusion of code and length of post. 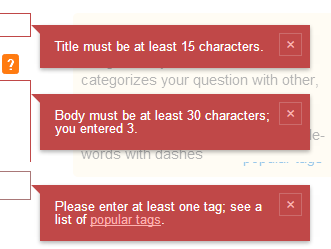 I know there is a 30 character limit already, but there's probably very few questions that would be "on-topic" and "specific" with under 100-200 characters (arbitrary values). This is by no means a definitive list of the checks that could be carried, more a starting point. You will also see a checkbox that they would be required to click before the the question could be posted. Not sure if there would be any value storing how many times this was checked on top of what SO already do to flag low value users. I'd forgotten about this prompt, but this is the kind of pre-post validation that I'm referring to. It's clear that it checks for both a URL and code, which are 2 of the initial checks I suggested for users targeted by the warning prompt. 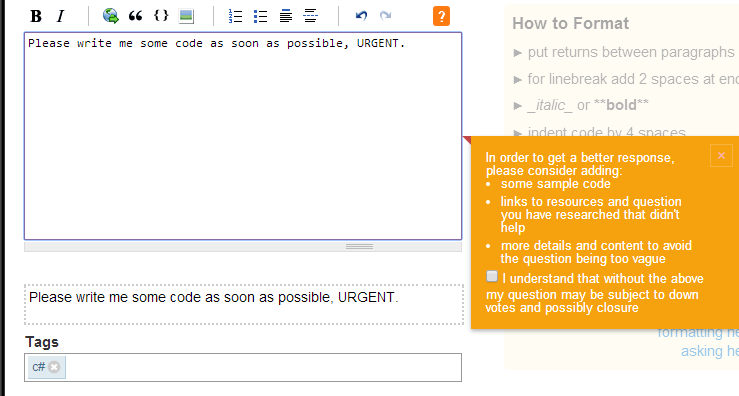 Once the question textarea loses focus, a call is made to: http://stackoverflow.com/posts/validate-body, which returns an array of errors, so I would just extend this to also return an array of warnings based on the post body and the status (rep, flagged, on a warning etc) of the user making it. While some of these have been suggested as behind the scenes checks that have been added to the algorithm to feed in to the Low Quality Review Queue, again could they not be used to warn users before they post? I understand from the podcast, they don't want to highlight all of the things that flag questions as low quality to prevent people circumventing the checks, but they state that they want to block and warn users where they feel that the user can learn something. I understand that, without the above, I may be prevented from getting answers to my question and taking a step towards getting banned from the site. Why is this question title considered subjective? I noticed that it displayed a warning prompt to the user, as you can see below. I'm wondering whether this feature request for additional prompting is being implemented to an extent, or is this existing functionality that I've not seen before? While the intention of this is good, I think it's too detached from the normal flow of people wanting to ask a question. Asking someone to go to a chat room and find someone that is available and willing to help there and then. I think the new users would outnumber the available mentors with a ratio similar to that of questions that require closing and available reviewers. The additional prompts with my suggestion wouldn't ask the new users to go anywhere, it would simply scan their question and prompt them with suggestions prior to posting. Me want. Me want now. For all the people who think How To Ask is sufficient, there is a very crucial difference. How To Ask has the fundamental problem of not being personal. It's a chunk of text that gives you some tips. It's not enough to persuade anyone who just wants to get their question answered now because my question is important. Because it's due tomorrow. You aren't going to get help unless you follow our guidelines. is far better because it's personal. They don't care about us. They care about themselves. They're not going to spend time reading a wall of text because they need the answer now. We're not the ones who are getting favours here. When asking for clarifications, we'll often get the response of "Yes! I'll do that now!" It doesn't matter that they've been asked before. They only care when it's a personal request. This makes it one. They'll care when the things we ask them to do are clearly linked to the answers they get. In my opinion, that is a superb suggestion. This is something that could be applied not just to users with a bad history, but any user who has yet to add very much quality content to the site (read: include new users). It could be rep based or something like the user not having enough upvoted questions yet. Warning the user that their question is not likely to be well received encourages them to take the guidelines more seriously. No, it won't reach everyone, but that's not the point of features like this. The point is to reach those who are willing to pay attention and do a good job. 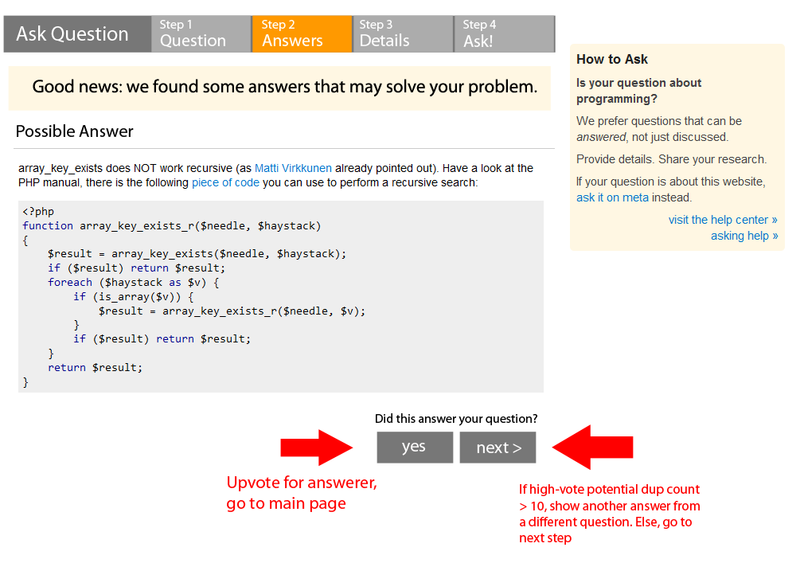 StackOverflow isn't a good fit for people who aren't willing to do that, and those questions should continue to be closed and downvoted. In other words, this is a feature to help users become good users, not a feature to filter out "bad" users. One would imagine that the message could actually be based on the content of the question. The question doesn't contain any links? Suggest to the user that they provide links to other resources they've already consulted. The question doesn't contain any code? 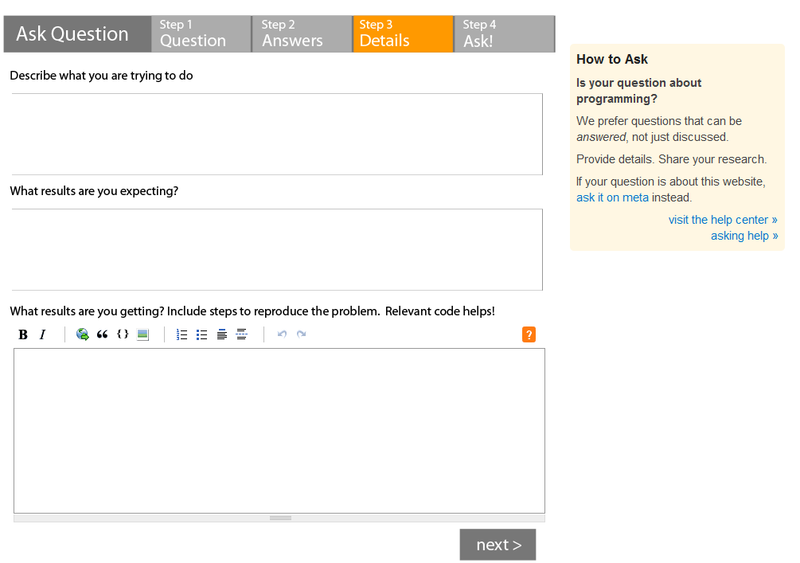 Suggest that most questions should contain some code that demonstrates the problem. Obviously, these particularly qualities are specific to StackOverflow, so I don't know how or if they could be extended to be useful to other sites. I think that basing the message on the content (and therefore making the message different every time) goes even further to "personalize" the message as Veedrac mentions. This shouldn't block the question, since as mentioned in the comments, very valid and useful questions lack these things sometimes, but the vast majority of good questions do include these sorts of content. This is where the checkbox comes in. What you're trying to do is continually get the user's attention and warn them that the quality of their content so far is subpar. The purpose is two fold, here. The first purpose is again to get the attention of users who want to do a good job; it gives automatic, constant negative feedback for not doing a good job. The second purpose is that it becomes easier to identify users who simply don't care, since they're being continually warned that they're not doing what's required of them. Whether either of these would really be effective, I'm not entirely sure, but I like the ideas. A little "Help" drop down in the corner is so easy to ignore and forget about, and having to dig through all those documents never felt very effective to me. Let's make it clear what "downvotes" and "closure" will actually mean to new users. This is a frequent subject of conversation, and I still think that a guided process is needed. I don't think prompts go far enough, we should endeavor to weed out the immediately obvious duplicates as much as possible in a way that funnels people to answers. Most simple questions have already been asked and answered in some form, and most bad questions are simple questions with bad wording or poor descriptions of the problem statement. The prompts have a good intention, but a prompt can be ignored. We should be taking a person under 1,000 rep through a hand-holding process that cannot be ignored and may result in the user getting an answer without ever having to type details. The other problem with prompts is perceived investment, the Sunk Cost fallacy. Once a user has started typing in the form, they are less likely to discard that work in response to a prompt because they feel they've already invested too much to back out. It is easier to just ignore the prompt and post the question. ... the point here is instead of putting even more information on the screen at once, we're slowing things down, asking the right questions in the right order, and at the same time teaching the user how to break down their problem in a way that lends itself to analysis. I posted pretty much the same idea a few years ago (here). It is so easy to implement I don't see any reason not to try it. Being a UI designer as well as a chess player, I have found the concept of "board blindness" very useful in approaching UI design. Board blindness occurs when a player sees some immediate move, say a hanging piece, and consequently does not take the entire board into consideration. Software users do the same thing: they want what they want and are often blind to the rest of the screen. Here's my image version of it (placeholder verbiage - would be expanded slightly/no ellipses, etc.) It places the help message directly in their area of interest: the question area. I know this post is 1 year old, but it still lacks a status-completed or status-declined. When I tried to write a new question, after searching SO and using google with no luck, I found similar questions that solved my doubt just by checking the linked questions in the right side. If I used exactly the same title when searching, I guess the new results were more appropriate maybe due to the tags I used. So, and related to Chris Baker's answer I would include a step asking the poster to check again these results while posting a new question; that would avoid a lot duplicates. 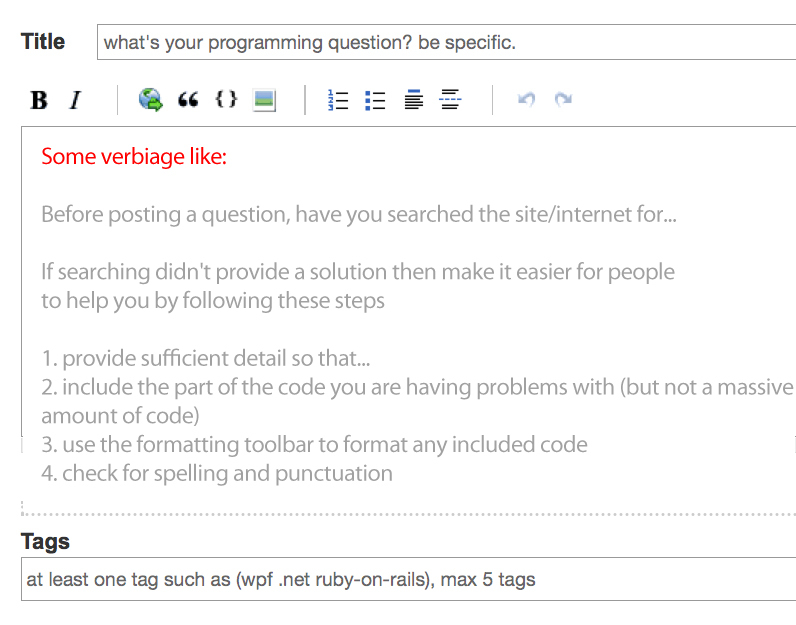 Also I think Tags could be chosen before writting the question body; I'm not sure if it would be better before or after the question title. I think the more refined idea proposed on Let's give the Original Poster a chance to post an appropriate question has some merit. The general idea is to provide a special layout for asking questions. One of the nicest features of that idea is that the topic dropdown would contain a number of "traps". That is, if you choose the option "find me a library", the UI would straight-up say "We don't do that here." Now, that won't necessarily stop everyone from asking, but at the very least we would tell them outright that it's not allowed. They can't claim ignorance anymore. And I really like the idea of having new UI options open up, like saying "Insert code here" for "My program is not working", with a link to MCVE explaining what they need to provide. That alone would solve numerous problems. I think the biggest flaw to that approach is that you make it harder for people who know what they're doing to ask questions. Even if it's optional, it would only be useful if it's the default case. Not the answer you're looking for? Browse other questions tagged discussion feature-request low-quality-posts new-users . Should SO provide in-line question templates to promote a balance between length of post and enough detail? What can we put in a question template to help people ask better questions? Should Stack Overflow be more restrictive about new user registrations? Why don't people sign up and contribute? How important is response time of the questioner regarding clarifications in triage? What is course of action required for a low quality question from new user?